Fondues were all the rage in the seventies but they suffered a bit of an image crisis for a long time and went the same way as black forest gateaux and prawn cocktail. However as with all things retro, they've come full circle and are in vogue once again, albeit in a kitsch kind of way. 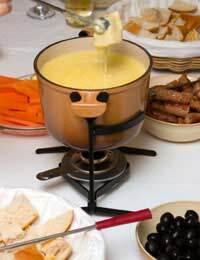 A fondue party is actually very easy to organise. There isn't much cooking involved, just lots of chopping, and guests pretty much serve their own food - what could be better! Once you've decided whether you're going for a sweet or savoury fondue (or both if you're feeling adventurous), you just have to prepare the sauce and chop up the ingredients for dipping. There's not much preparation involved in a fondue party, there's little washing up and all you really need to do is supply small plates and forks for dipping the bread or fruit into the fondue pot. You can buy special pots and forks, however, if you just fancy trying a fondue party as a one-off, you could use any sturdy pot such as a casserole dish. There's also no need to worry about inviting more people than you normally would to a dinner party. As long as you have space for everyone to sit, and enough forks for dipping, the more the merrier! Here are a couple of classic fondue recipes. All you need to serve with this classic dish is some nice crusty bread. Mix together the cornflour and Kirsch to form a paste. Set aside. Pour the wine into the fondue pot and bring to the boil on the hob. Once boiling, reduce the heat and gradually add the Emmental and then the Gruyere. Stir well as you add it, so that it melts. Once the cheese has all melted, add the cornflour paste to the pot and stir well. Season well with freshly ground black pepper and stir over a medium heat for about 5 minutes, until the fondue has a nice thick consistency. If it is too thick, you could add a little more wine or a little boiling water. Serve as soon as possible after preparing and just place on the table, with the bread, for your guests to help themselves. Break the chocolate into pieces and place in a bowl over a pan of simmering water. Stir lightly until it has melted. Pour the cream into the fondue pot, place on the hob and bring to the boil slowly. Carefully add the chocolate, stirring as you do. Stir well to combine then remove from the heat. Allow the fondue to cool slightly while you arrange the fruit on a large plate or serving platter. Place everything on the table for your guests to help themselves.